Our Director, Michael Bischof, collaborated with Lewis Street Primary School to enhance their early years outdoor learning environment. Michael worked closely with the school to design areas for investigative learning, ball play, physical development, imaginative play and relaxation. The children now have access to engaging messy play equipment that will inspire investigative learning and teamwork. Our new and magnificent Water Wall will inspire the children to discover science and improve their push and pull technique when pumping the water. The children can now design and build their own route for the water to flow. Pump it to the top and watch it go! While the children pump the water, it will begin to flow down our new Damming Station which is connected to the Water Wall. The children will need to work in teams to try and stop the flow of water. To transform the area into a mini quarry, we installed a Rope and Pulley System. It will take collaboration and cooperation to transport materials across the system! We also added Weighing Scales to introduce children to measurements, weights and mathematical and scientific topics. Moreover, we included a Tuff Spot Table due to its versatility and the fact it is an ideal resource for art, design and exploring materials and textures. We can now extend the boundaries of our classroom to the outside through the installation of a huge Timber Canopy which is attached to our building. This will expand the opportunities for enhanced outdoor learning and will provide shade and protection during wet weather conditions. Our Canopy is fully cladded and glazed with a truly waterproof roof which is of the highest quality. 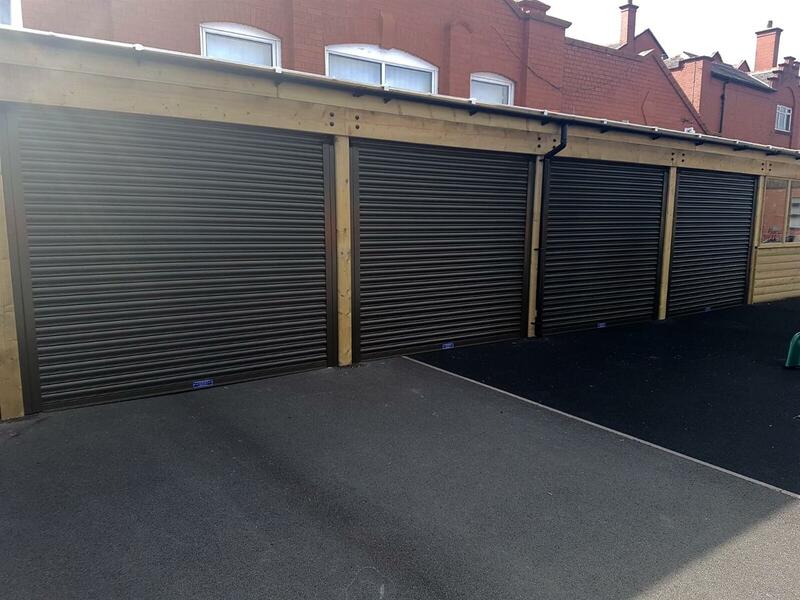 It also includes electric roller shutters which will keep our play equipment and resources safe and secure out of school hours. We also included benches, coat hooks and a fire door for safety purposes. This huge 17m x 4m Canopy will create an amazing free flow play environment and act as a stepping stone from inside the classroom to outside. To encourage role play, we installed a wonderful Giant Playhouse complete with a giant chalkboard. This open-ended resource is a special place for role play and drama, building relationships and connecting with friends. It is a versatile resource which can be transformed into anything from a Bakery to a Travel Agents. Near to the Playhouse, we installed a Decked Seating Area complete with a Shade Sail. Perfect for long summer days playing outdoors when you need a little shade, this is a great spot for children to gather for group sessions, relax and pretend play. 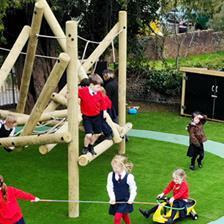 It’s safe zone to escape from a noisy playground and reflect on learning and the surroundings. 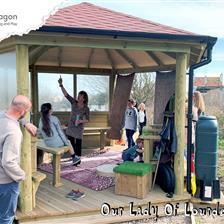 The area also includes Moveable Artificial Grass Topped Seats to provide the children with alternative seating. Together with the decked space, this could easily be transformed into a performance area. We created a designated roadway for the use of bikes and trikes. 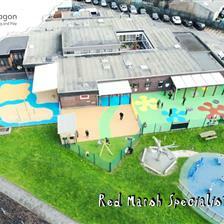 This was created using our Safeturf Safety Surfacing and includes all the colours associated with the road. The design includes parking bays, road signs and a zebra crossing which will help develop the children’s understanding of the world and teach them about road safety. We installed a colourful Ball Target and Basket Ball Net to create a Ball Play zone. Fantastic for friendly competition, while aiming for the targets, children will naturally develop their hand - eye coordination. It was a pleasure working with another fantastic school in the Salford/Manchester area and we hope our development has inspired the children to further their understanding of the seven areas of learning. Are you looking to develop your early years playground? Contact Us and we will be in touch to arrange a free consultation and design presentation.